One of the things about the improvisational trio format is the fact that there is no room to lay back. This is certainly the case for the Colin Vallon Trio, whose debut Rruga has just been released by ECM. The trio consists of Vallon (piano), Patrice Moret (double-bass), and Samuel Rohrer (drums). Although Vallon is clearly the leader, the trio share compositional credits fairly democratically. Where one truly hears the cooperative nature of the players most effectively though is in the music itself. 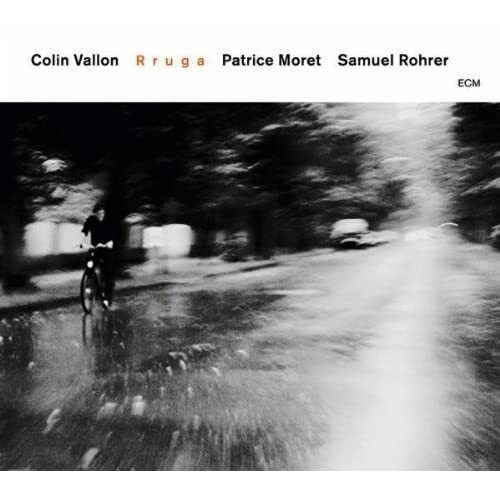 The bright and beautiful piano of Colin Vallon opens the disc with “Telepathy.“ But it would be an enormous mistake to ascribe any lesser roles to the playing of Moret and Rohrer. Samuel Rohrer’s drums in particular add to the tension of the tune, both with the beat he establishes, and his inventive brush strokes. As is the case throughout the 11 tracks that make up Rruga, Patrice Moret’s bass is unmistakable - whether soloing, or in this case merely holding everything in place. Moret’s bass is extremely prominent in the very next track, “Rruga.” The trio engage in a furious exchange during this cut. The song is a prime example of why they have received such praise for their live appearances. “Rruga” is what excellent trio-format jazz improvisation is supposed to sound like. Other outstanding pieces on the album include “Polygonia,” “Meral,” and “Noreia.” This last tune is a real tour de force. The song opens with a near-exact quote of the Pharoah Sanders classic “Hum Allah.” As the introduction fades, we are in the more familiar territory of piano-based improv, which builds to a climactic finish with all three thoroughly committed to their vision. Although nothing on Rruga would ever be mistaken for free jazz, there is one track which shows that there may have been an Art Ensemble Of Chicago disc floating around the studio. “Iskar” is the shortest piece of the collection at 2:50. It is also the only one credited to all three members. For just under three minutes, percussion, odd piano flourishes, and bass combine for a memorable trip to inner (or outer) space. Rruga closes with the appropriately titled “Epilogue.” The track begins with what amounts to a bass solo. Vallon and Rohrer then come in to take us into the pure zone of improvisation. The trio’s musical compatibility is apparent throughout Rruga, and this closer is no exception. The Colin Vallon Trio have acquitted themselves nicely with their recorded debut. They cover a great deal of territory over the course of this album, and I am very much looking forward to hearing more from them.